I took a brief time out half-way through reading William T. Vollmann’s monumental 800-page National Book Award-winning novel about the Eastern Front in WWII, Europe Central (2005), to read a less-weighty but no less impressive collection of short stories by Danilo Kiš, A Tomb for Boris Davidovich. Kiš (1935-1989) was a Serbian writer who lost his father to the Nazi death camps and wrote with a heightened sense of the insanity of totalitarian ideology (both German National Socialism and Soviet Communism) and anti-Semitism. Kiš’s stories are masterful portraits of psyches twisted and adrift across the European landscape of the first half of the 20th century. (With one detour, a harrowing tale titled “Dogs and Books” about a 12th century religious pogrom, which Kiš clearly intended to parallel Stalin’s 1930s Moscow Trials.) At least one story, “The Mechanical Lions,” verges on a kind of dark slapstick, with a Soviet bureaucrat—needing to woo a visiting French communist critical of the persecution of priests—tasked with temporarily converting a cathedral back into a house of worship after it had been confiscated and transformed into a brewery and an atheist museum following the revolution. Comrade Pyasnikov demanded that the poster with the slogan RELIGION IS THE OPIATE OF THE PEOPLE be removed and promptly replaced by another with a somewhat more metaphysical sound: LONG LIVE THE SUN, DOWN WITH THE NIGHT … Under my personal supervision a hundred and twenty prisoners from the nearby regional prison camp carried out another restoration of the church, in less than four hours. 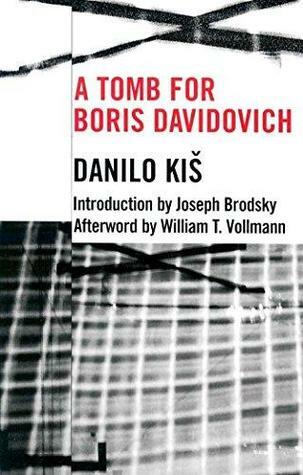 This book is dedicated to the memory of Danilo Kiš, whose masterpiece A Tomb of Boris Davidovich kept me company for many years while I was preparing to write this book. Sign into Goodreads to see if any of your friends have read A Tomb for Boris Davidovich.